Magickally, Rutilated Quartz is used to energize and increase the Effectiveness of your magick. connection between them and the physical body. 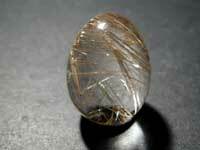 Rutilated Quartz promotes determination, self-confidence and strength of will. Rutilated quartz is believed to have the power to regenerate the bodys tissues, aid in the assimilation of nutritional elements, bolster the immune system, and slow the advancement of aging diseases. They also credit it with treating respiratory illnesses and being able to uncover the true cause of an illness. This is an important stone for uncovering the root of mental hang-ups, strengthening resolve, easing the pain of loneliness and improving communication. It is also has the effect of unburdening the mind of guilt, which can lead to a state more conducive of happiness and inspiration. It can help get the wearer out of ruts where he or she is given over to sloth or wantonness. Its needles are said to attract love and to help with mental focus. It opens the Third Eye Chakra, for spiritual communication in dreams and meditation and for stimulating the immune system. When healers do Chakra layouts, they place it near energy areas they think are sluggish.